Yes. McMagyar. The newest kitsch to come to the city on the Duna. 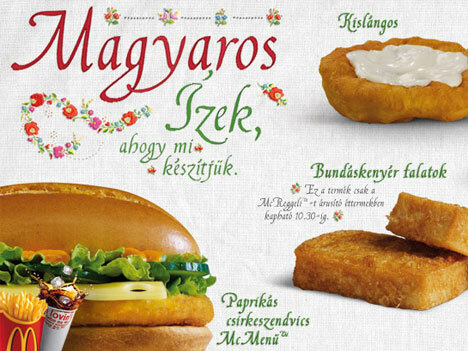 One of the promotions to celebrate the 20th anniversary of meki coming to Hungary was to create this little McMagyar menu, which included a small lángos and a paprikás chicken sandwich. We tried the kislángos, which I described here as a favorite of market shoppers. It’s a piece of fried dough which is usually topped with a creamed garlic sauce and white cheese. As much as I wanted McDonalds to screw it up and therefore hate it, I have to admit it was actually pretty good. Though part of the excuse of ordering a lángos at all is that it’s a piece of the ambiance of the central market, a once-in-a-while-I-swear kind of foods. I suppose if they become usual drive through fare at the Hungarian McDonalds, it will just seem, sadly, American. but there isn’t anything better than a real vásárcsarnok-made-in-front-of-your-eyes-and-you-will-smell-like-lángos-for-a-whole-day. this is unquestionable. or when the lady at lehel tries to make it a little healthier for you by adding a “salad” on top. with the very typical hungarian sweet corn in it.